Mumford and Sons kicked off a three-night residency at the Ryman Auditorium yesterday evening, and everything was going so well until frontman Marcus Mumford ran offstage to puke. Let’s backtrack a bit. The night began with opening sets by Gill Landry and Abigail Washburn, both newcomers to the Ryman stage. Washburn’s mix of Americana and globetrotting folk music was met with the most applause, thanks to an appreciative hometown audience and some clutch contributions by her band, which included a small string section. After peaking with the title track from “City of Refuge,” the set came to an old-timey close with an unplugged version of “Bright Morning Stars,” performed from the lip of the stage. 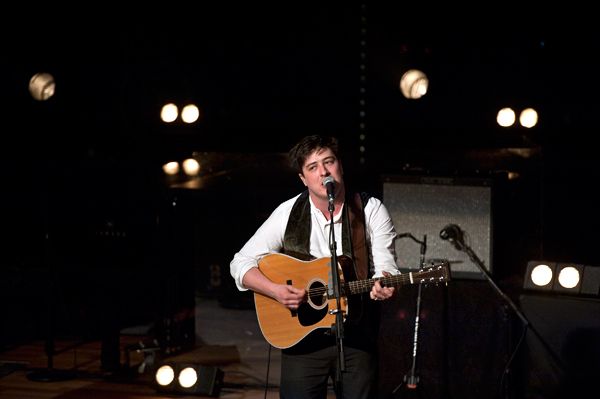 Apart from a recent benefit show in New York, Mumford and Sons haven’t played any gigs since last year. Occasionally, the rust showed, especially when the guys took stabs at some of their newer tunes. But the mistakes were all minimal — Marcus flubbing a lyric, Ted Dwane singing his harmony parts slightly out of sync with the others — until halfway through the set, when the band was forced to completely abandon “Thistle and Weeds” after Marcus forgot the words. Whoops. A few minutes later, Marcus took a seat behind the drum set — yes, the band uses a full a drum set now, if only for two or three songs — and was bowled over by a coughing fit. He took a moment to recover… then held up his hand, signaling the need for more time… and then ran offstage altogether. Bandmate Ben Lovett began playing a few random chords on the grand piano, hoping to kill some time while his buddy searched for cough medicine, but he gave it up once the roadie snuck onstage to whisper something into his ear. And then, with a promise that they’d be back in five minutes, the rest of the band went off into the wings, too. When they came back, some of the magic had been lost. They knew it, we knew it, and they knew that we knew. So, instead of plugging their instruments back in, the guys walked to the front of the stage and delivered an intimate version of “Sister,” accompanied only by Lovett’s accordion. Then, after returning to their microphones and treating everyone to another cut from their second album, they closed out the night with “The Cave.” The song felt like an arena-rock anthem, and the place exploded all over again. So what was Marcus doing backstage? Throwing up, according to the singer himself. Maybe it was nerves. Maybe it was the sheer shock of sharing the stage with Jerry Douglas earlier in the night, when the Duke of Dobro showed up for a string-band cover of Simon and Garfunkel’s “The Boxer.” Whatever the reason, the show did manage to recover… but here’s to hoping the next two nights are puke-free.